Next to the obligatory plastic cups and the sign offering free toothpaste to forgetful travelers was this plastic sign in my room at the Gainesville, Texas, Quality Inn a couple weeks ago. One could almost be offended that they're implying you might take something. I mean, who steals a generic Quality Inn item anyway? Quality Inn, mind you. Maybe people who fancy they need a towel or a hair dryer take them. I think if I stole something like that, it'd end up being the tell-tale hair dryer, revealing itself to the Interstate Hotel Stuff Police after I screamed "dissemble no more! I admit the deed! - open my cabinets! here, here! - It is the whirring of the hideous hair dryer!" I was tempted about 20 years ago when I stayed at the Dinosaur Inn in Vernal, Utah, and they had these dinosaur logo-printed pillow cases. 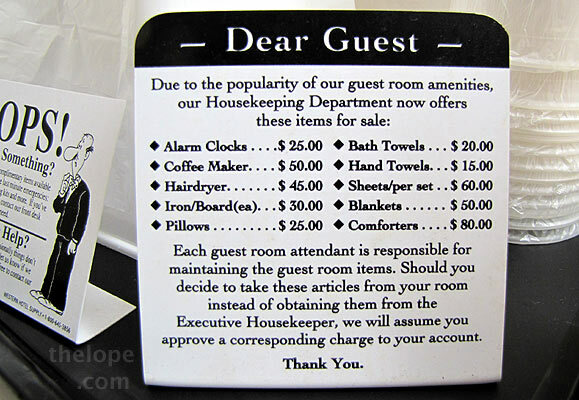 With some effort, I hunted down the head housekeeper and she apologetically told me she'd have to charge four dollars. I've seldom forked over four bucks faster. Of course, I did inherit a Holiday Inn ashtray with the cool googie sign printed on it from one of my relatives and I don't think Holiday Inn sold those things, so maybe I'd better get off my moral high horse.